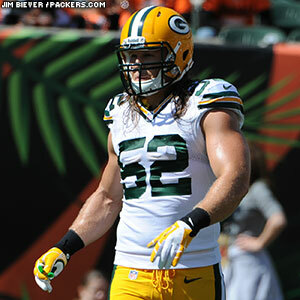 The Packers coaching staff awarded game balls to five players for their performances at Chicago in Week 17. CB Jarrett Bush was recognized on special teams, while WR Jordy Nelson and RB James Starks were the recipients on offense, plus CB Tramon Williams and LB Andy Mulumba on defense. Bush had a tackle on kickoff coverage and a forced fumble on a Bears kickoff return. 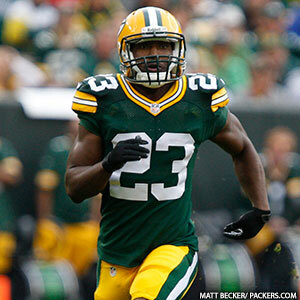 He also recovered a fumble by teammate Micah Hyde on a punt return. Nelson had a career-high 10 receptions and a season-high 161 yards, while Starks had 11 rushes for 88 yards as part of the offense’s four-TD output. Nelson’s 161 yards were just one yard shy of his single-game career high, while Starks’ 88 yards were his most this season since Week 2. Williams was credited with six total tackles (five solo) with two pass break-ups and one forced fumble. 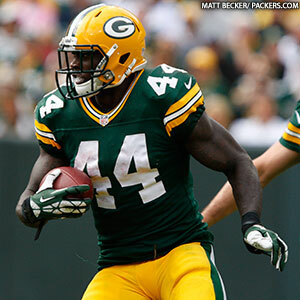 Mulumba, an undrafted rookie, had a sack among two tackles for loss and three total tackles. Packers QB Aaron Rodgers and RB James Starks have been voted the Air & Ground NFL Players of the Week for Week 2. 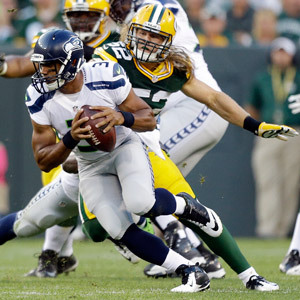 Rodgers tied a franchise record with 480 yards passing in Green Bay’s 38-20 victory over Washington. He completed 34 of 42 passes with four touchdowns and no interceptions, posting a passer rating of 146.0, the third highest of his career. The 34 completions tied his career best. Starks took over for Eddie Lacy (concussion) in the first quarter and rushed 20 times for a career-high 132 yards, including a 32-yard TD. He became the first Packers RB to rush for 100 yards in a regular-season game since Brandon Jackson in Week 5 of 2010, and the first to do so in any game since Starks himself rushed for 123 yards at Philadelphia in the 2010 NFC Wild Card playoff contest. He could smile and laugh about it because it was the preseason, but Mike McCarthy clearly wasn’t buying the explanation he got for why his challenge of a call at the goal line was overruled on Friday night. On their first offensive drive of the night, the Packers went for it on fourth-and-goal at the 2-yard line and handed off to RB James Starks, who was tackled and ruled down at the 1. Trying to push through the pile, Starks appeared to reach the ball out across the goal line without his knee hitting the ground, so McCarthy challenged the play, only to see the call on the field upheld. Asked for the explanation he got from referee Carl Cheffers, McCarthy obviously wasn’t satisfied. “The ball was over the goal line. Carl said he could not see his knee,” McCarthy said. “His hip was three feet off the ground, so I couldn’t see his knee either. 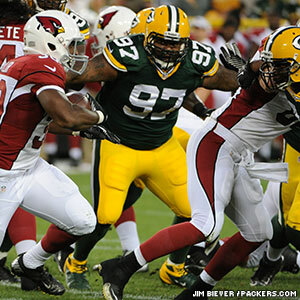 For a full recap of McCarthy’s Saturday press conference, click here. Randall Cobb in, Jordy Nelson out at practice Tues.
WR Randall Cobb was practicing during the media portion of the Packers’ jog-thru workout on Tuesday, but WR Jordy Nelson was not. Cobb missed last week’s game with knee and ankle injuries but appears on track to return this week for the rematch in the NFC Wild Card playoff against the Vikings. Nelson injured his knee in last Sunday’s game at the Metrodome and came out briefly but returned to catch a game-tying TD pass in the fourth quarter. Also not practicing on Tuesday were WR Jarrett Boykin (ankle) and DE Jerel Worthy (knee), who both left Sunday’s game with injuries. CB Davon House was back at practice after missing last week’s game, and DB Charles Woodson continued to practice and could be on track to return after missing the final nine games of the regular season. At running back, Alex Green didn’t play in last Sunday’s game but was practicing. Also, RB James Starks was at practice with helmet in hand, but in the portion open to the media did not appear to be participating. Mike McCarthy will address the media after practice, near the top of the hour. Post-practice update: Cobb spoke with reporters after practice and said he expects to play on Saturday. McCarthy declined to comment on Nelson’s absence from practice, however, only saying he’d have more information on Wednesday. The first official injury report of the week will be on Wednesday.